Scenario question allows you to create a branched simulation which challenges a learner to make swift and accurate decisions in the vivid recreation of a real-world situation. To make it even more interactive and engaging, you can also choose a character and background that fits your subject. NOTE: You can simply use one of the pre-made characters and backgrounds from the image library but if you want to upload your custom images, note that characters should be uploaded as PNG files with a transparency effect on and use the JPEG format for backgrounds. Creating a scenario implies generating all of its scenes and linking them together in the order you choose. Start by adding a new simulation to your section. Give it a name and open it to edit the contents of the scenario. Create a new scenario by clicking on a blank simulation window. This is a short video tutorial on how to create and link scenes inside the simulation editor. 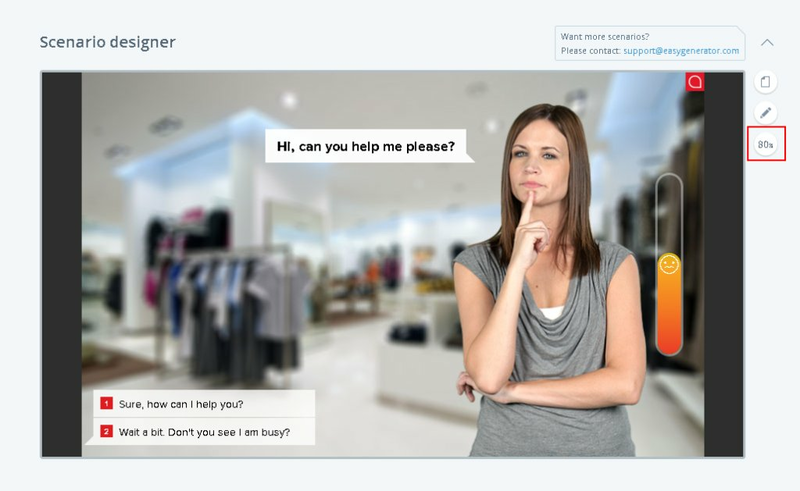 To enable your learners to successfully submit a scenario question, you need to properly adjust the final scenes. Make a character happy, set the score to 100 and make sure that the final scenes of your scenario contain the main text and feedback only (no reply choices). Also, you need to set a mastery score for the simulation.